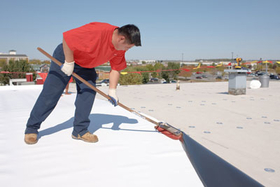 A Firestone worker installs UltraPly TPO roofing membrane. BETHESDA, Md.—It started as a way to showcase EPDM, and now it is a champion in the battle against roofing regulations. The EPDM Roofing Association has changed a lot since its beginnings 10 years ago. The association was founded by Firestone Buildings Products and Carlisle Syntec. Both companies thought that EPDM—despite being a model of consistency for about 40 years—was overlooked in favor of new ones, such as thermoplastic polyolefin or PVC. The association's mission was to ensure accurate scientific information available on the use of EPDM. Ten years later, the organization finds itself battling more than just misconceptions. It serves to ensure EPDM does not become over-regulated in favor of other products promoted to be more environmentally friendly. And the association is stronger than ever. It added another manufacturer, Johns Manville Inc., in 2012. The ERA also includes six associate members and an affiliate member. Even though it spends more time combating regulations, that mission is intertwined with its initial goal of promoting EPDM through accurate, scientific studies. The ERA conducts the Long Term Service Life Study. It looked at five EPDM roofs in the field that had been in use for at least 20 years, took samples and had them laboratory tested. Thorp said the study showed 20-year EPDM roofs are performing as good or better than when they were installed. That hasn't stopped regulatory bodies from trying to mandate the use of white membranes for environmental reasons. Thorp said a variety of codes and standard setting bodies have tried to get those kinds of TPO standards passed. In the past year, the American Society of Heating, Refrigerating and Air-Conditioning Engineers had a proposal to require white roofs in climate zone 4 if a building wanted to be designated as high performing. Climate zones are designated based on the temperature range of the region. Based in part on the ERA testimony, Thorp said the proposal was not approved. The ERA had another win with the International Code Council, which had a proposal within the International Energy Conservation Code, to require white roofs in climate zones 4a and 4b. The ERA provided updated data that showed roof color was not the only factor in measuring environmental gains, Thorp said. Thorp said one of its biggest wins came when the ERA worked with various Northeast and Mid-Atlantic states about new regulations concerning adhesives and sealants. The ERA didn't oppose the new regulations on VOCs; in fact its members were developing the products to meet the new regulations, but it wanted to make sure an implementation schedule was in place that didn't negatively impact the industry. Johns Manville entered the EPDM membrane roofing manufacturing field when it renovated and upgraded a 235,000-sq.-ft plant in Milan, Ohio, purchased from Tenneco Inc. The firm invested about $55 million on the Milan project and more than $125 million in its commercial roofing business, the company said when it opened the facility in June 2012. The company describes its first year with the association as a success and enjoys being part of the contribution process on a number of key issues in the industry.